This TV’s 1280×720 pixel resolution brings you crystal clear images so the quality of the visuals displayed on it are enhanced. 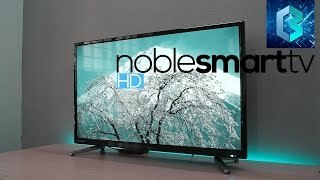 Host movie nights for your family and friends, and watch entertainment on this HD Ready LED TV. This TV offers a wide viewing angle of 178 degrees so everyone in the room has a clear view of what’s being telecast. Experience true audio clarity with Noble Skiodo TV’s two powerful 10 W speakers. Crafted with high-quality materials, these speakers add a new dimension to your audio-video experience. 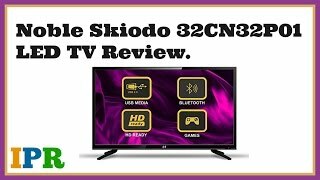 There’s no room for boredom with this Noble Skiodo TV set. It comes loaded with interactive games which are built into it. Choose your game and play it using the TV’s remote control. This TV’s slim bezel eliminates any space between the screen and bezel, you almost feel like you’re one with the content you watch on screen. Its high gloss finish gives it a stylish edge and allows it to be the perfect fit for modern homes. The Eco Smart feature in this TV automatically shuts it off when you aren’t watching it. This TV also incorporates a customizable backlight option which ensures that it consumes less power, thereby making it environmentally friendly. This TV’s Epoxy PCB with moisture-free components make it resistant to damages because of exposure to moisture present in the air. Just using it for past two days. Excellent Value for the Price paid (15,490 through prime). Picture quality & Audio Quality is pretty Good. But No Audio Out option to connect to any Home theater if I am not wrong. Just go for it.